When I ordered the Ludwig Breakbeats, I wasn’t sure if it would live up to my expectations. After all, it was a Ludwig drum kit and Ahmir “Questlove” Thompson, drummer of Jimmy Fallon’s house band, had designed it. So I thought it was too cheap to be good. So I got the kit and I played and played and played it. And in this Ludwig Breakbeats review I’ll tell you what I found out in the process. Its features, its pros and its cons. And finally, I’m going to tell you whether I think it’s a valuable kit. By that time, though, you’ll be able to make an informed decision yourself. Who’s the Ludwig Breakbeats for? Also, don’t just take my word for it, and see what Vincent had to say about the Breakbeats after using it for a while. …you can fit this kit into a 5” x 3.5” area (without you sitting behind it). With a normal ride stand it would be 5” x 4.5”. Please be aware that the product picture of the Ludwig Breakbeats is misleading in most online shops as it does not come with hardware or cymbals. So, out of the box it would look like this, without the snare stand. Queslove designed the Breakbeats kit with NYC drummers in mind, because it’s quite normal there use the subway to get your set to gigs. Plus many NYC apartments are too small to fit a bigger-sized drum set in. young / little beginners (below 5ft) who want a kit that sounds far better than any of the exisiting junior drum sets. Be aware though that the Breakbeats kit will be more expensive as most junior drum sets come complete with hardware, cymbals, stool and sticks. At the same time this set is not good for someone looking to play heavy metal. 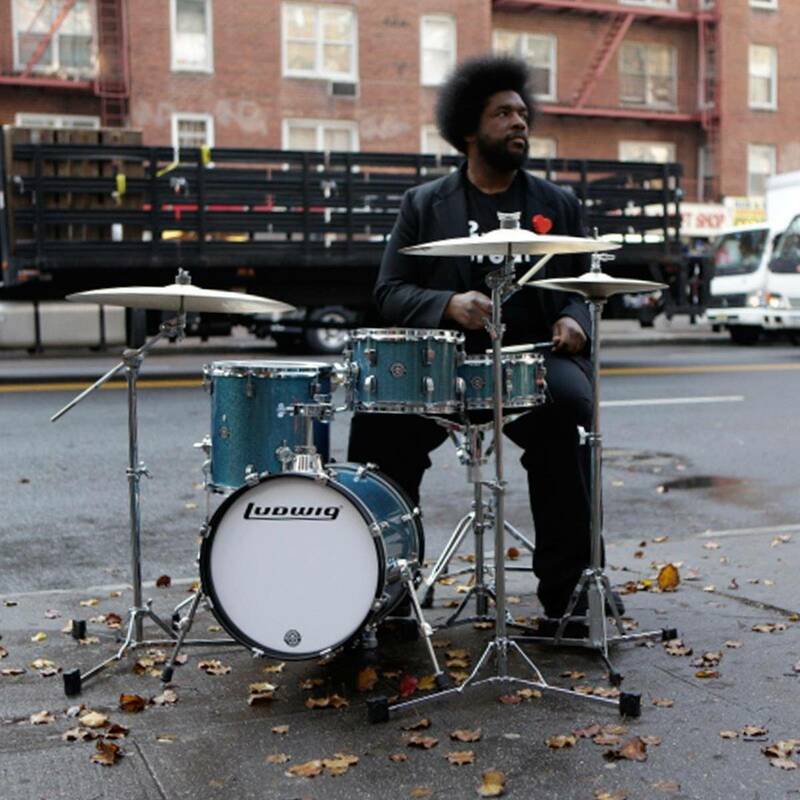 It’s not that Questlove’s Breakbeats kit wouldn’t deliver the sound for it (it does). But I think it doesn’t look all too appropriate on the heavy metal stage. Innovative for sure, but still looks a bit too experimental to me. What do you think? So, I see the Breakbeats used a lot by drummers playing Jazz, Hip Hop, R&B, Funk or quieter shades of Rock. 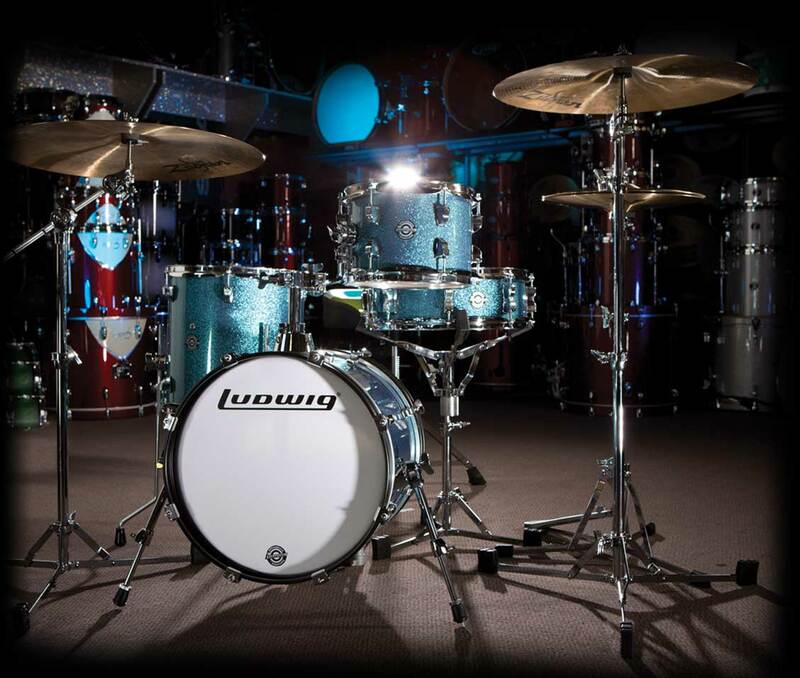 For Ludwig drums, the Breakbeats kit is extremely well-priced at 399$. Yes, this doesn’t include hardware or cymbals (I’ll get to that when talking about the cons below), but it includes a very well sounding set that solves a crucial problem for many drummers (storage & transport). And Amazon ships it to you for free. The only thing to be aware of is that Ludwig put up a separate article for each of the color finishes of the set (black sparkle, azure blue sparkle, white sparkle). So you can’t change color on the product page, but you will find an overview of the finishes here. The ride cymbal can be mounted directly off the bass drum. This way you can save money on one stand plus reduce the weight and footprint of the kit even further (5” x 3.5”). I’ve made good experiences with this DW cymbal boom arm. All finishes of the Ludwig Breakbeats are sparkle, and that really makes them an eye catcher with lights turned on on stage. And looking good on stage is invaluable, because audiences will judge you more by your looks than by your skill. 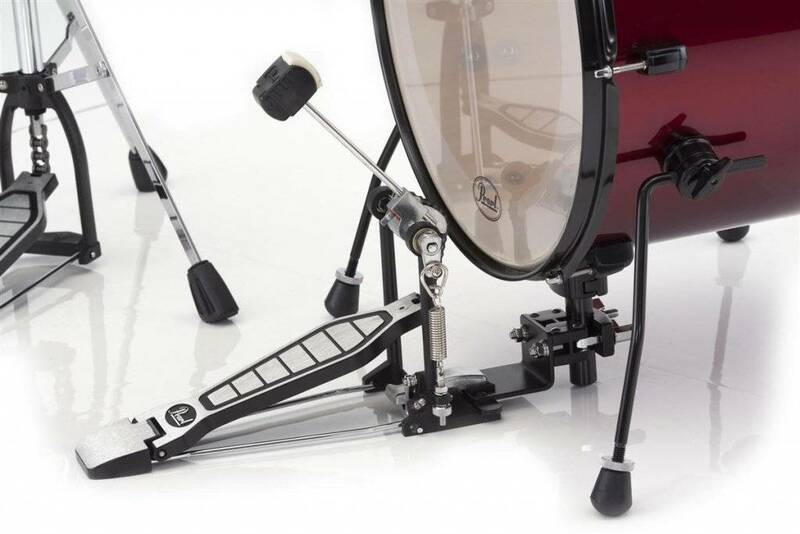 Whether you use the riser or not (see cons below), you’ll be able to use a double bass pedal with this kit. But unfortunately, it doesn’t. I tweaked the pedal-to-riser connection a lot, but always ended up with either a chain that is blocked by / has contact with the hoop edge or a beater which hits the head at a non-90° angle (so it doesn’t hit with full force). 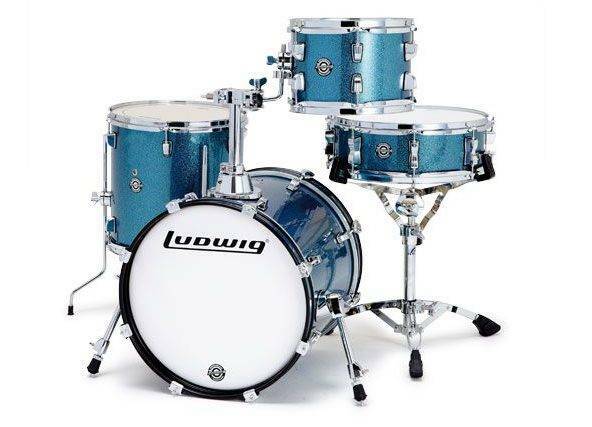 …go for the Ludwig Breakbeats pack complete with cymbals and hardware. But I’d recommend you buy the above hardware, cymbals and stool individually. That will cost around 100$ less and you won’t end up with the pack’s mediocre cymbals and hardware. If getting your hardware and cymbals alongside the kit is important to you, check out the Pearl Roadshow set in my best beginner drum set review. In that case, the hardware will be decent, but the cymbals will sound pretty crappy. So it depends on whom you’re buying for (kids will care less about sound quality), and how much you’re willing to spend. If you want to look into another kit that’s very similar to the Ludwig Breakbeats, try the Sonor Martini. And read my review of it here. Actually, I think you can’t go wrong with this kit no matter if you’re a beginner or advanced drummer (and adult or child). There’s only one caveat: you need to be ready to spend the extra money for hardware, cymbals and stool. If you are, I’m quite certain that the Ludwig Breakbeats will make you happy. Yes the full Breakbeats pack along with hardware, cymbals, stool and kick pedal is not my favorite option (see “Cons”). But this deals is just too good to let it go: the pack is now a freakin’ 60% off (including shipping). (Spotted August 4th, 2016). So that’s my Ludwig Breakbeats review for you and now I’d love to hear back. If you’ve got a question, a story to share or simply disagree with me, let me know in the comments. I reply 100% of the time. I really hope that his Ludwig Breakbeats review was helpful to you! If so and if you decid to buy a Breakbeats kit, please consider going through the links on this page. This way, I’d receive a commission at absolutely (!) no extra cost to you, and you’d reward me for the care and effort I’ve put into this Ludwig Breakbeats review. And if you’re unsure about my reviewing ethics, take a quick look at my affiliate disclosure. I am 26 years old and have been drumming since I was 15. I now have three boys ages 4-6 that I’d like to start teaching. I’m looking for a set that will be playable by both myself and my boys. Seems like all my research points to the Ludwig Breakbeats. I like the 10″ Tom and larger bass as compared to the Sonor Martini. Any other helps in regard to the perfect hybrid kit for young kids and adults?? My initial thoughts are that I can set the stand locks for each part of the drum set about 3-4″ lower so that when my boys sit down to play, all I do is unlock the locks, drop down the throne, cymbals, and drums to a more appropriate level. I want to make sure they can comfortably reach the pedals. That sounds very plausible! 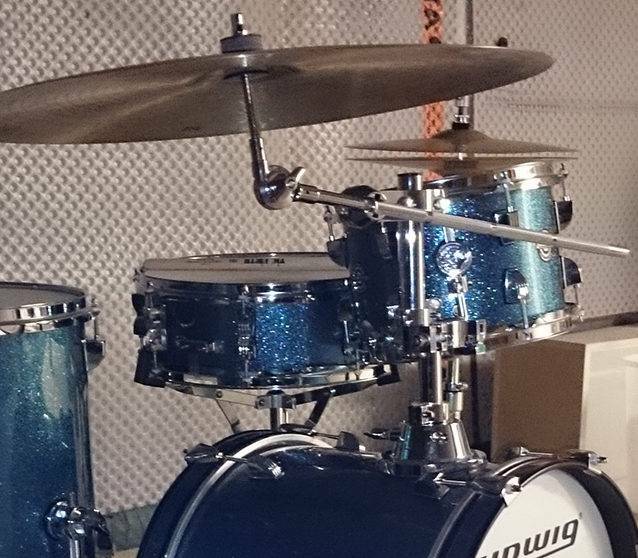 I’ve never had kids play on my Ludwig Breakbeats back when I owned on – but a compact kit certainly is the best option between going for a junior kit and quickly replacing it & buying a full size kit that will make your kids uncomfortable while playing. So I see no reason not to do buy a compact drum kit. And I think the Ludwig Breakbeats is among the best options on the market. If so & if you decide to buy, it would be tremendous if you went through the links on my site! Hi. I’m reading your drum reviews as I’m looking at a set for my son who is 11. You may or may not know this, but does Amazon routinely offer the 60% discount you have crossed out from Aug of 2016, on the quest love breakbeats set? No, this is not a routine discount and I can’t tell you when or if it will come back. That said, from my experience the chance for discounts increases before Cyber Week (end of November) and throughout Dezember. If you let me know the exact model you’re looking for – with a link – I can monitor the kit and send you a notification as soon as the price drops too. I’m looking specifically at the Break Beats set you reviewed or the More budget priced Pearl set – the jazz arrangement seems most like the breakbeats set. You mean the Pearl Roadshow, right? May I ask why you’re not considering the Roadshow as your first option? For the Breakbeats comes without cymbals and if you buy them extra, you’d easily pay more than for the Roadshow in total. Don’t get me wrong: the Breakbeats is a great kit – but it’s specifically designed for drummers who are gigging a lot and have to carry their sets around frequently. The Roadshow Jazz should be about 4′ x 4′. If you sequeeze it a little you could get down to 4′ x 3′ I suppose. Thanks for the great review! I just bought this set as a gigging/throw in the car and take anywhere set, so I’m using cymbals/mosy hardware from another kit. Looking at the pearl arm you linked to saying you can mount a ride from it, what else would I need to get to actually put into the tom mount from the kit? Looks like you have a metal rod or something in your pic, but it went a little fuzzy trying to zoom in. Also, I use a paiste signature series 20” bell ride, do you think it would hold? Thank you so much! Good cymbal there 🙂 I’m now using a different stand which I’m very satisfied with. Unfortunately, I can’t guarantee that it will hold, since the biggest I have used on the stand is an 18” cymbal. It looks sturdy enough to me, but that’s about as much as I can tell you. I am planning to use a double pedal on the base and play metal stuffs. Will the base be able to withhold double pedal drumming without any damage, wear and tear. And by the way how is the pearl export series (made in 2006 i think so 😊) according to you. Are the drum skins and finishes as good? Thanks for your quesiton! You can read all about the Export here. …perhaps this is not the best set for you if you’re looking to play metal primarily. Perhaps the Pearl Export or Tama Imperialstar would be better suited for that. I’ve been playing the Breakbeats mic’d through PA at medium to large gigs for a month now. For starters, I can’t believe how big they sound. I had planned initially to sideline the 8-lug snare for my trusty Yamaha Vintage Maple but I’m quite happy with the Breakbeats snare. As for the bass drum riser, I’m able to get it to work properly with the bass pedal that comes with the packaged Ludwig Atlas Standard hardware kit, priced slightly below the cost of the Breakbeats (1 straight cym stand; 1 boom cym stand, snare stand, hi-hat stand, & bd pedal). I also added a Protec Multi-tom bag (on wheels) that holds Breakbeats bass & both toms. I use a separate rolling case for the snare, mics, cables, & misc accessories. A small trap case (on wheels) holds all the hardware. Overall, I give this kit a high rating. Poplar is an excellent sounding tone wood for drums but fragile – meaning that over time I’m expecting the drums to go “out of round” due to extensive travel. Therefore, I purchased an inexpensive full replacement warranty from the online retail outlet I bought the drums from. 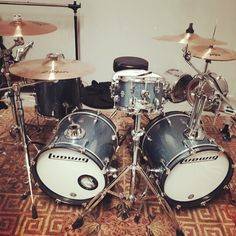 I wish Ludwig offered a “better” version of this exact kit made with 2 maple plies for each drum plus hardware for around $1000 street price, or offered their Neusonic kit in these sizes. Kudos to Ludwig & Questlove for making an affordable kit that’s loads of fun to play. I recommend the Breakbeats to anyone looking for small size / big sound. Thanks so much for this detailed breakdown of your experience with this kit. That’s an amazing help for other people for sure. I’m on mobile right now, but will link to your comment from within the review on Monday. Also, I’d have happily included the URL you have in your comment, but the website it led to could not be reached. I’ve you want it included, let me know once it is fixed an I’ll reinsert it. Now it works! Interesting site. Hope some other people coming here will take a look too. Maybe u can help me with this. In between Breakbeats and Pearl Midtown. Do u have any experience with the midown kit? Im looking for a set that have a good ”punch” in the kickdrum. I mainly play funk/soul/pop. Thanks for your question! Unfortunately, I can’t speak about the Midtown from personal experience – but I can tell you should be able to get a very good punch out of the Breakbeats kick drum. You can also see at what another buyer had to say about it here.